DealZone | 0% discount deal in Cape Town - THIS MIGHT BE TO BIG TO EAT! The Surf & Turf Mega Platter (200g Sirloin Steak, Prawns, Calamari, Chips, Onion Rings, Rice & Garlic Sauce) and a Dessert for 1 Person at Hooked, Plumstead! THIS MIGHT BE TO BIG TO EAT! 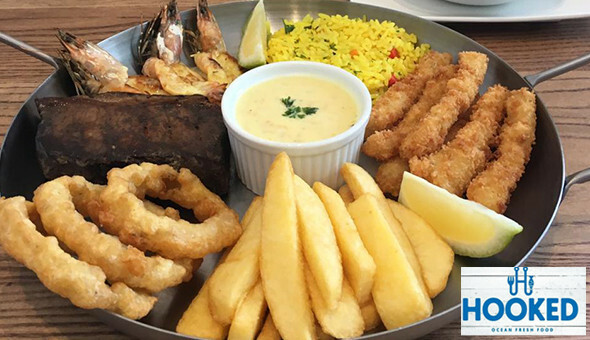 The Surf & Turf Mega Platter (200g Sirloin Steak, Prawns, Calamari, Chips, Onion Rings, Rice & Garlic Sauce) and a Dessert for 1 Person at Hooked, Plumstead!